IntelliTerm is not your typical adware application, because it does not function as a browser extension, but as a system service. 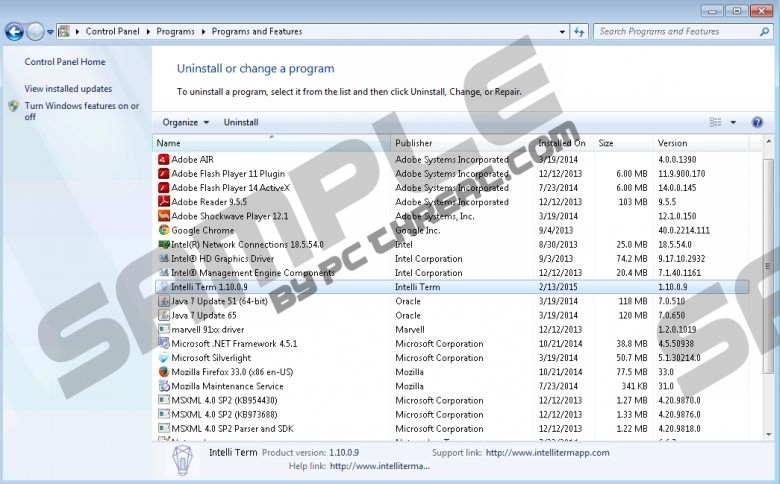 However, regardless of its less common method of execution, users should remove it as it is no different from all other ad-supported applications that you may encounter. Above all, this application has been specifically developed to display intrusive ads that might be dangerous, because its developers fail to endorse the content that they promote. As far as its declared functionality goes, it must be said IntelliTerm is not “the best study tool” nor is it a tool at all. Thus, we at Pcthreat.com recommend users to remove it as soon as possible. IntelliTerm is advertised as an application that makes searching and translating information a lot easier. Nevertheless, it may be argued that the functionality of this application is problematic, because oftentimes the application simply doesn’t work at all, which only adds suspicion to its reliability and should encourage you to remove it. However, there is one function that IntelliTerm executes flawlessly. Indeed it does a good job at displaying multiple intrusive ads such as coupons, pop-ups, in-text ads, banners, and so on. We advocate users to delete IntelliTerm, because it is an unreliable adware application that may be used to promote fake ads, which might severely damage your computer if you choose to click on one. The developers of IntelliTerm are the ones responsible for the dangers you may encounter while using the supposedly useful tool. The developers are often obliged to promote some infamous third parties, because they get paid for generating web traffic to their websites. On top of that, users should remove IntelliTerm because it has the ability to collect information, such as browsing history, IP address, search queries, cookies, and so on. This information then might be sent back to the developers for processing. The collected information is analyzed and adjustments are made so that specific ads are displayed for certain users, which increase the chance of a click. It must be mentioned that the content promoted could be illegitimate or fake, because cyber criminals often utilize adware applications such as IntelliTerm for their illicit activities. Regardless how you got IntelliTerm on your system, we encourage you to remove it as soon as possible, because the ads it promotes could be described as unreliable or even fake. You could end up being scammed by cyber criminals and so on. Furthermore, the application often does not perform the functions that its developers have boasted it would perform. All in all, IntelliTerm is a lousy investment, which can only bring more problems than benefits. Delete it today and save yourself from a lot of trouble in the future. Quick & tested solution for IntelliTerm removal.